It must be a lot of pressure to be the king! After all, it’s game over when you go down, so your pawns are really counting on you to keep it together. Maybe that’s why the king moves so cautiously and only takes it one space at a time. The good news is that everyone around you will be doing their best to make sure you don’t bite the dust. The queen will be scurrying around the board, fervently trying to protect you. Those knights will be in a tizzy trying to keep you out of harm’s way. If you want to have the entire board trying to protect you like that, then maybe it’s time to become the king! 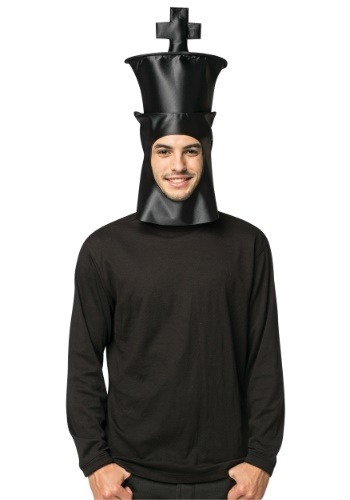 This adult king chess piece headpiece lets you look like the most important piece to the game. The top is designed to look like a black chess piece and has a black cross on the top. Just slip it on and it’s game time! Just remember to only move one space at a time.